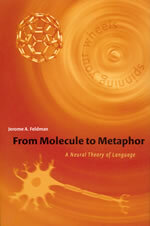 I stumbled onto this particular show on podcast: Neural Theory of Language, it is part of the KQED Forums program, a talk with Jerome Feldman, EECS professor at UCBerkeley, and an author of “From Molecule to Metaphor: A Neural Theory of Language.” . I kept on rewinding it as i listened, learned something new every time. An amazing field. How our brains work? How do we learn knowledge? What exactly happened biologically when you learned a new fact? 1. Our brain is completely different from a computer. Computer processes information in a linear fashion, while our brain is vastly parallel. 2. neurons are slow, but our brain is fast. The reason being most of our “knowledge” is hardwired between neurons. There are two forms of knowledge of our brain, one that relies on chemistry in the brain that is similar to a kind of “computation” to go from one neuron to the next. But when it comes to something we learned really well, there is minimum computation, but mostly direct “wiring” between one neuron to the next. The learning process is a process of subtraction, to reduce the multiple paths existed, and as a result to reduce “computation” required. I’m fascinated by this aspect of the talk. So when we were given a piece of knowledge, such as, Mr. Feldman was born in Pittsburgh. The moment this information was given, there certainly wasn’t a hardwired connection instantly created. Instead, there was a chemical reaction that “added weight” to certain path and resulted in a connection. 3. Children learn language by map an abstract concept, i.e. a word, with their real life experiences. When a child started learning to speak, he/she already accumulated roughly one year worth of experiences. The learning to speak process is a process of “subtraction,” a process of “hardwired.” So if there is to emerge a human-like robot, a simulation of real life experience is mandatory. 4. People who were bilingual since childhood are better equipped to acquire more languages because their neuron structures were adapted in certain way that become optimal to learn new languages. Neurons are most active at growth during childhood. This professor’s favorite phrases are “That’s not my area of expertise, so i can’t comment on it.” “This is not my theory but … ” It is obvious that this area of research has been divided into very thin slices that each expert only takes on one and dives deep. But for us non-academic people, this sounds funny, because we could hardly grasp the basic knowledge of the landscape, how could we tell which leaf on a particular tree that belongs to Professor Feldman?